BANGI, 17 July 2012 – A book regarded as a landmark study on the Muslims in Patani, a state in southern Thailand entitled ‘Muslim Merit Making in Thailand’s Far South’ which has attracted international interest was launched at The National University (UKM) here last week. The book by Prof Christopher M. Joll, a Patani-based Research Fellow at the Muslim Studies Center, the Institute of Asian Studies, Chulalongkorn University is based on 10 years of his anthropological fieldwork in Southern Thailand. Patani is one of the four Malay states there involved in a struggle for autonomy. 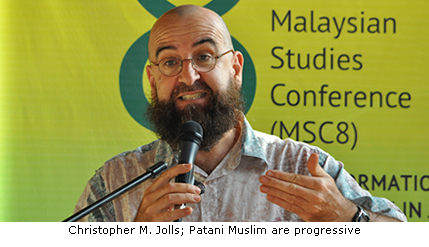 Unlike other popular books on the four Malay states including Patani which focuses on conflicts, strife and violence, Prof Joll’s book focuses on other aspects of being a Malay Muslim in southern Thailand concentrating on ‘merit making’ which is central to being a Muslim. Merit making is the opposite of committing a sin. A glimpse of the table of contents of the book shows it carries topics normally found in a book on Islamic jurisprudence (Fiqh). Thus it covers topics such as fasting, the obligatory prayers, funeral prayers and the Haj pilgrimage in the Patani Malay context, all of which are the normal activities expected of a good Muslim which were drowned out by violence and clashes. It shows how the Malay Community in Cabetigo Patani practice Islam and all the positive aspects of Islam. He said those engaging in violence do not have a clear agenda. The violence is really an offshoot of many underlying issues such as identity and unequal developments in the area. There are many positive aspects found there but people tend to focus on the bombings and other aggressive and violent acts. Writers visiting the area go there to write certain events they witnessed and then write about it. “They are not part of the community to paint an accurate picture of who or what the Patani Muslims are. And often times a negative image is more memorable than a positive one”, he said. Prof Joll spent his time there not as a mere academic observer but participated in the rituals including attending weddings and gatherings. He was accepted by the community of Cabetigo which gave him the insights into their lives and religious practices. He was accepted as someone who is part of the community and not as a stranger. Three other books which are compilations of papers written by various authors from both the region and the west were also launched at the function. The books are ‘Social Science and Knowledge in a Globalising World’ edited by Prof Wan Zawawi Ibrahim, ‘The Gaze of the West and Framings of the East’ edited by Prof Shanta Nair-Venugopal and ‘Malaysian Youth in the Global World : Issues and Challenges’, edited by Prof Hazita Azman, Dr Bahiyah Abdul Hamid and Zarina Othman. The book launching event was part of the International Malaysian Studies Conference (MSC8) held in UKM. Present at the launching was Prof Emeritus Dato’ Dr Abdul Rahman Embong from the Institute of The Malay World and Civilisation (ATMA); Prof Rashila Ramli, Director of Institute of Occidental Studies (IKON), students and lecturers.